I've been painting with my friend Chris Beirne to prepare for our art exhibit in September. 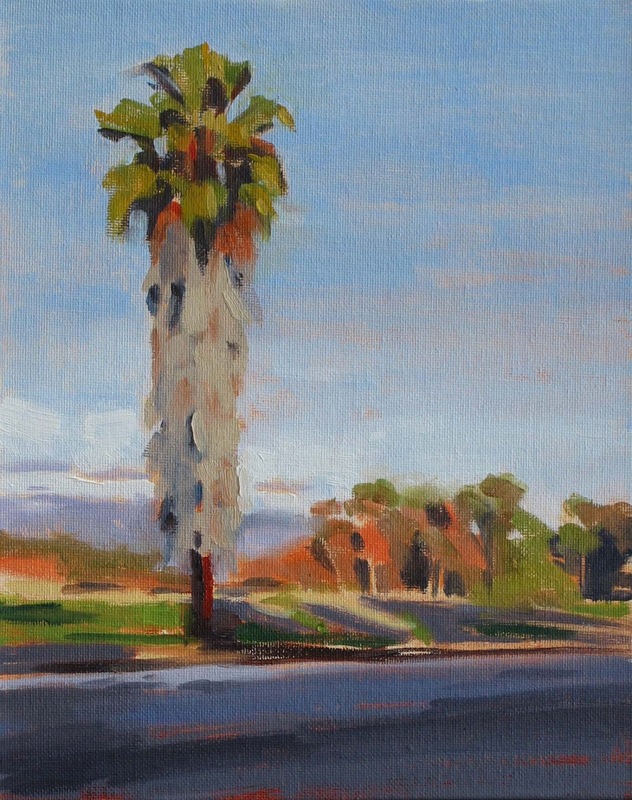 Recently we were scouting a painting location in Santa Barbara and we ended up back in Ojai. We decided to head over to Chris's favorite painting spot on Besant Road, to paint as the sun was setting. The meadow where we painted is called the Ojai Preserve, an open space with walking trails and Eucalyptus trees in the background. As the sun dropped lower in the sky, we set up to paint. The trees behind me were casting a shadow on the road and there was a red/orange tint in the background in my scene. The light was shifting which gave me a more dramatic value range to work with. We painted for about an hour before the entire scene was engulfed in shadows. The beauty of painting at sunset is the warm glow the sunlight casts on everything, however, you have to paint VERY quickly. 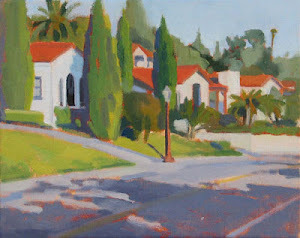 After I returned home I did the painting above in my studio, using my plein air painting as a reference. I have to add some information about this palm tree, since I love to paint palm trees. It's a California Fan Palm (Washingtonia Filifera), the only palm native to the Western United States and an iconic palm tree in California.